Philips Electronics sub 1m&Omega; MOSFET. PHILIPS Electronics has announced the development of a sub 1mΩ MOSFET. This device demonstrates a reduction of approximately 40% in the on-state resistance for MOSFETs compared to conventionally packaged products. It also demonstrates technology advancements that will be implemented in new power management products. By reaching low levels of on resistance, designers can better manage power distribution, reduce board space and improve electrical efficiency within their systems. Philips offers the lowest on resistance Rds(on) of 1mΩ in a TO220-type package. The was achieved through the use of copper clip technology. A copper plate provides a low on-state resistance for applications where power loss and heat dissipation are critical, such as computer mother boards. Low on-state resistance is also an important feature for automotive applications where high currents need to be switched with minimum power loss. Normally MOSFETs are connected to the top of a chip by using a weld where the wire bond would go. 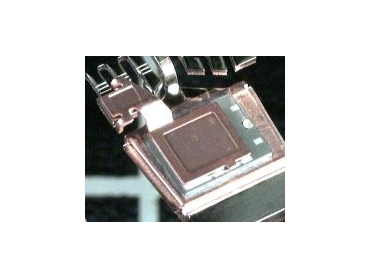 With copper clips, instead of connecting to a single point, the entire surface of the chip is connected, improving current distribution and thermal properties. MOSFETs in LFPAK for example, realise practical circuit improvement over similar type packages, a direct result of the findings made through the sub mΩ development. To break the sub mΩ barrier, silicon with low enough resistance had to be manufactured using Philips' patented self-aligned process. In addition, solderable top metallisation for the silicon was necessary to accommodate the copper clip process. Careful design of the copper clip and development of the leadframe were needed to ensure good control of the clip position and a good assembly process. As a result, Philips was able to take the best available silicon technology and packaging technology, optimise it and meet the target of less than 1mΩ.